With less than a week to go until the planned launch of the full site the following article or ‘press release’ has been put together to fully detail the aim of the site and AlanThomsonSim as a whole. One week ago we launched the ‘freeware’ side of AlanThomsonSim and immediately realized we had underestimated the overall popularity of the site as the server ran out of resources within minutes. Since the freeware launch the site has had nearly 2 million requests and served over 500GB of files. There are currently more than 1,000 registered users downloading up to 500 files a day. The site continues to grow as we opened up the user submission form and have to date more than doubled the amount of files we have available. We have since made a significant investment into a much faster and more capable hosting package which can far better cope with the demand. We are committed to ensuring that the site runs without significant limits to put everyone’s creations within reach of the entire community. Brought up in Scotland and known for ‘slumming it out in a shed,’ Alan Thomson lives near Cambridge with his wife and three children. Since an early age he has been intensely interested in trains and the railways and owns an ever increasing collection of railway memorabilia. He also has a fanatical interest in simulation and this began on the flight simulation platform. Even as far back as Microsoft Train Simulator Alan has been an avid train sim fan and has spent countless hours on this platform and more recently, the Train Simulator and Train Sim World titles. Just over two years ago Alan took the decision to start making videos and uploading them to his YouTube channel where he has found a worldwide following. 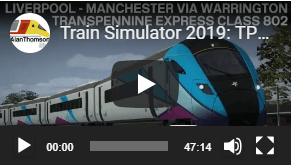 He enjoys videoing a variety of different products set over a vast array of routes and eras produced by everyone from big names such as DTG, AP and JustTrains to scenarios, routes and reskins made by independent developers. He has become known for his honest opinion, his faithful optimism and open mindedness when previewing a product which has meant his videos have found favor with over 7,000 subscribers. Alan also has a Twitch channel and a Facebook Group which were initially set up to compliment the YouTube videos however each has grown into it’s own community. His Twitch channel runs on a Sunday and Wednesday from 7pm and is founded on a more ‘pub like’ atmosphere where he has a chat and interacts with his viewers. In late 2018 he became the first person ever to complete a full East Coast Mainline run from London to Edinburgh across one route, finally arriving into Edinburgh at 02.15 am. Alan’s Facebook group serves an ever expanding community and provides user product support and is a place where all things train sim can be discussed. Alan more recently took the decision to create AlanThomsonSim.com as the existing marketplace for 3rd party content had become very fragmented and spread out. Each producer, whether it be freeware or payware, has their own website which meant visiting a vast array of different sites to get all the content he needed. The vision is to create a one-stop-shop of Train Simulator content all under one roof. 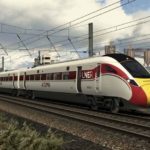 Whether it be hosting the files directly, creating link partnerships with other sites or reselling great payware content the aim is to simplify the user experience and bring more Train Simulator content to more enthusiasts than ever before. The ultimate aim of AlanThomsonSim is simply a one-stop-shop of content which is convenient and easy to access. But there is far more to AlanThomsonSim than just that. We plan to use some of the proceeds from the site to reinvest in the community. It also pays for things like the costs of hosting the site and the administration of it but is mostly aimed at more important things. These are projects such as simply getting assets produced for the community to use or investing in some great tools to make the simulator even easier to use and manage. Some will be used to invest in new and upcoming products to make them even better or even investing in the building of a whole new route or train based on community recommendations. The site may make a profit. If it does, great – that means we can return even more back to the people that make it what it is. You. The community. Overall the majority of the income from the subscriptions goes to paying for the significant cost of hosting freeware content without limits or restrictions. Unfortunately the technology to bring you freeware files at the speeds we want is not cheap and has to be paid for. One way of doing this would have been to charge a small subscription to all users of the site to access any files. This obviously was not the road we wanted to go down so therefore we have created the subscription meaning those who want to pay, can pay and they get rewarded for their support. Ultimately this means we can keep freeware totally free and unrestricted to everyone and provide a great service with some exciting benefits for subscribers. We already have a lot of great content on the site. 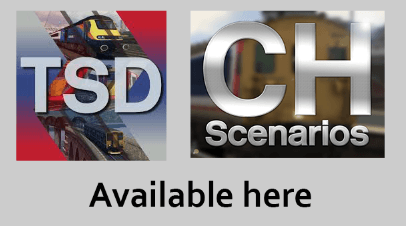 From detailed routes to engaging scenarios to quality reskins we have an ever expanding catalog of products from some leading authors such as Train Sim Designs, CH Scenarios, HM Simulation, MrDreamliner and many others. We also have a lot of upcoming authors uploading some exciting content and we want to celebrate that as much as we can. We are committed to the concept of ‘freeware is freeware’ and therefore do not charge for access to the vast majority of files on the site. We do not limit or restrict access to free downloads in any way. We want the maximum amount of people to be able to enjoy what authors create and therefore make it as simple as possible for them to reach our global audience. Every Author is truly in control of their downloads. Files can be hosted on Alan Thomson Simulation or through external links such as Google Drive, Mediafire or Dropbox. Every author gets their own store page which they can customize to make it their own. They can link directly to this page and share their store to a variety of social media platforms. We are constantly keeping an eye on uploads to the site and frequently select products that catch our eye to make into a YouTube video or run on Alan’s Twitch streams. We feel this is a great way to promote user generated content to the greatest amount of people we can. As it stands we are planning for a full launch with all systems active on Sunday 10 February. This is dependent on a few factors coming together before that date and is still subject to change. With every subscription made in the first 28 days of the subscription program being launched you will be entitled to one free AP pack from the given list and a free copy of RW Enhancer. Sadly we are unable to offer any other packs in this offer at the moment but other subscription offers will be run throughout the year and the complimentary products will change every now and then. We have an installer tool which greatly reduces the amount of time and effort required to install 3rd party Train Simulator content. This will be free to all subscribers. The tool remains under constant development and will be updated as time goes on to include further features and capabilities. 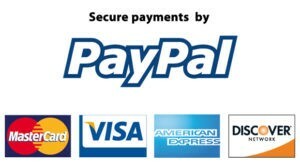 A subscription will entitle the holder to a 10% discount on all payware bought through the site. A subscription allows the holder access to a range of complete and beta products which are not publicly available. Each product is reviewed with it’s developer and some may remain in the subscriber only section indefinitely whilst some may be subscriber for their testing phase and others for a determined period of time after their release. There is no ‘one size fits all’ approach and we work closely with developers to come to the best arrangement. We’re learning and the community is growing fast. We know we are not perfect and some people may choose to wait before subscribing or using the site. That’s fine, in fact, we would love your feedback on things. As we are just launching there might be a few issues but please bear with us . We have tried to test and fix as much as we can but there can always be issues that remain. Just drop us an email or find us on Facebook and we will do what we can to sort it. You are backing us, we really appreciate this and can’t wait to grow the site into something much bigger and more exciting for everyone. The subscription payback scheme is a way of us reinvesting some of the proceeds of the user subscriptions with the people who create products. This is more than just a payment for products, it is a way of thanking creators for their time and hard work. All authors on Alan Thomson Sim get their own product pages and a store page which showcases all of their content. They can edit their information to provide a background to themselves and have full control of their listings. Subscription products get even more features to really show the product off. We help creators out with a multitude of different things from testing, asset creation, marketing, product delivery, hosting and support. The income from subscriptions means we can offer these benefits to more and more creators to celebrate their work. A portion of the monthly income from subscriptions is allocated to the payback scheme and then shared between the creators hosting subscription products with us at the time. We allocate a minimum of 80% of the first months portion of all new subscriptions and then up to 20% of the remaining subscription spread over the remaining months. This investment means that not only can we provide a platform which helps creators grow and make their content better and better it means that subscribers can feel they have a part in the process as well as getting some exclusive benefits as a thank you. Is it only a cash benefit scheme? No, although we may hand some of the proceeds out to creators as cash should they wish, we also thank them in other ways such as heavily discounted or free DLC. We already have a few exciting products from one of the best known 3rd party payware developers: Just Trains. We are delighted to be able to bring you these products and many more in the future. We are already in talks with a variety of other developers and aim to be able to offer even more great products soon. We are always looking to add 3rd party ‘payware’ created by users in the community. 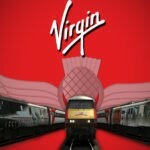 This might just be a collection of great scenarios, a new route or even a whole train! We offer fantastic commission rates and can put products in front of hundreds of thousands of visitors. All subscribers are able to enjoy 10% off any payware on the site. 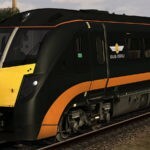 We are proud to be able to give back to the Train Sim community but also want to be able to do our bit to support the wider rail community and it’s heritage. We have a range of railway charities and worthy causes which we will guarantee to donate 10% of any profits generated by the site to. These are ‘days out’ that are organised by AlanThomsomSim. Generally held at locations like the Crewe Heritage Centre, York Railway Museum or other similar places, the aim is to bring the community together and give people an opportunity to meet at some great rail locations. We plan to use some of the proceeds from the site to cover the costs of these and provide a great day out for everyone. Anyone can come along and join in and you are not tied to any kind of schedule. It’s just a great day out with other like minded people. We aim to hold 4 of these events each year across the country in different geographical locations.